This engaging episode of Oregon Public Broadcasting’s Oregon Field Guide features Portland’s Heritage Tree program. 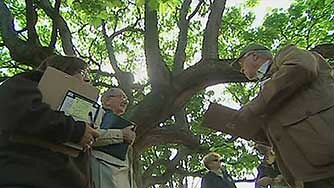 A Heritage Tree is one of nearly 300 trees in Portland that are protected from future development because of special qualifications such as age, size, shape, botanical value, and history. Started in 1993, the Heritage Tree program selected the first Heritage Tree in 1994. Anyone can nominate a tree between May 31 and August 31 by completing and submitting this form. 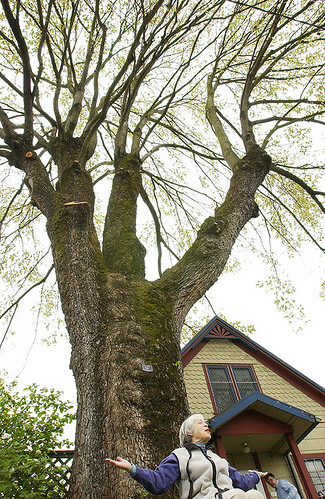 The Heritage Tree Committee works with Portland’s Urban Forestry Commission to review all applications, assess the nominated trees, and recommend the qualifying trees to Portland City Council, which votes on the Heritage Tree designations. An obligation to care for a Heritage Tree conveys from one homeowner to the next. You can see photos of each Heritage Tree on Portland Parks & Recreation’s web site. As of November 10, 2010, the city had designated 286 Heritage Trees, which represent 121 species. More than half of them are on private property. Friends of Trees is one of many groups in Portland supporting Portland City Council’s adoption of tree policy reforms to protect and enhance the city’s urban forest. Read more about the Citywide Tree Project and the upcoming March 9 council meeting to discuss and vote on the reforms. Love trees? Looking for meaningful work in a supportive, fun work environment? Then check out our opening for a Neighborhood Trees Specialist.